The Concert For George brought together some of the world's finest performers for one unprecedented night of celebration. This remarkable book follows that story, from the rehearsals, the sound checks, to the stage and beyond. George's friends and family share their personal memories, with archival photographs from over five decades illustrating their words. Only 2,500 hand-crafted, numbered and signed copies created. Olivia Harrison: "We celebrated the life and music of the beautiful 'quiet' one from Liverpool who became a man of many words as well as worlds, a wise, coveted friend, father and true seeker...He did all this, and much more, and still managed to have more fun than the rest of us." Contributors: Paul Theroux, Eric Clapton, Joe Brown, Terry Gilliam, Tom Hanks, Ringo Starr, Ravi Shankar, Eric Idle, Gary Brooker, Olivia and Dhani Harrison, and many more. Box: Each copy is housed in a hand made solander box bound in silk-screened fabric over padded boards. Extras: Inside a pocket in the box is an original concert programme from the Royal Albert Hall, November 29th 2002. 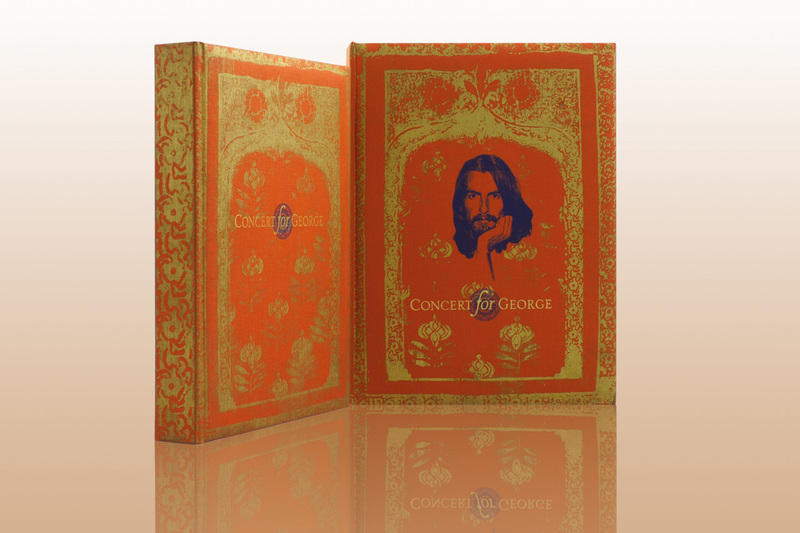 The 28-page commemorative booklet is printed on art paper, bound in an embossed cover and fastened with an orange silk ribbon. In the pocket you'll also find four laminated back-stage passes.